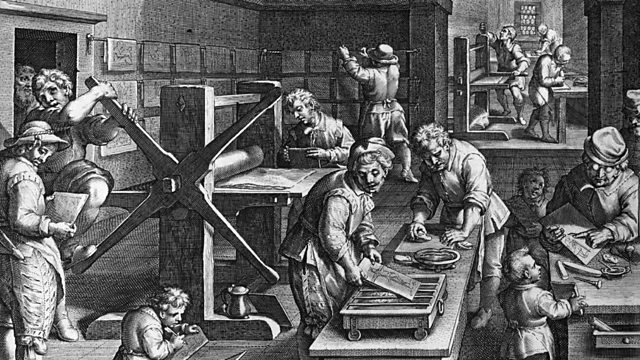 Melvyn Bragg discusses 17th century print culture, the new technology of printed text reflected controversy in every area of politics, society and religion. Melvyn Bragg and guests discuss 17th century print culture. "Away ungodly Vulgars, far away, Fly ye profane, that dare not view the day, Nor speak to men but shadows, nor would hear Of any news, but what seditious were, Hateful and harmful and ever to the best, Whispering their scandals ... " In 1614 the poet and playwright George Chapman poured scorn on the popular appetite for printed news. However, his initial scorn did not stop him from turning his pen to satisfy the public's new found appetite for scandal. From the advent of the printing press the number of books printed each year steadily increased, and so did literacy rates. With a growing and socially diverse readership appearing over the sixteenth and seventeenth centuries, printed texts reflected controversy in every area of politics, society and religion. In the advent of the Civil War, print was used as the ideological battleground by the competing forces of Crown and Parliament. What sorts of printed texts were being produced? How widespread was literacy and who were the new consumers of print? Did print affect social change? And what role did print play in the momentous English Civil War? With Kevin Sharpe, Professor of Renaissance Studies at Queen Mary, University of London; Ann Hughes, Professor of Early Modern History at the University of Keele; Joad Raymond, Professor of English Literature at the University of East Anglia.